Electra Meccanica CEP Jerry Kroll introduces the single-seat Solo commuter car back in 2016. 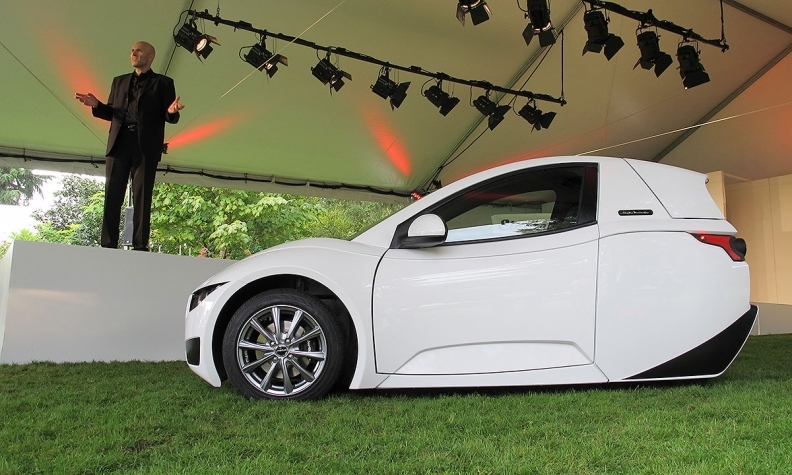 VANCOUVER — Electra Meccanica has put its first production Solo single-seat electric car into customer hands. Leona Green and her son Matthew, who run the Greens and Beans deli in suburban New Westminster, B.C., received their car – in British Racing Green – in late June, Electra Meccanica CEO Jerry Kroll said. “They got it for their personal use and for delivering catering to their customers,” he said. The Greens were No. 1 on Electra Meccanica’s reservation list, waiting two years for the vehicle. The locally built three-wheel EV, priced at about $20,000 boasts a 160-kilometre range and top speed of 130 km-h.
Kroll said the second production Solo is scheduled for delivery to a local family in early July. “The first 40 or 50 cars will all be in the Greater Vancouver area in case there’s any issues,” he said. Kroll said certification to sell the Solo in the United States is proceeding. Electra Meccanica’s common shares were also approved in June for trading on U.S. over-the-counter markets under the symbol ECCTF. Kroll said the company initially raised CDN $11 million from its stock offering. The company reported a net loss of almost $9 million for 2016 as it ramped up production of the Solo, compared with a roughly $1-million loss in 2015. In a recent filing to U.S. securities regulators, Electra Meccanica warned it expected to continue incurring losses as it develops and markets the Solo. Its auditor drew attention to a note in its annual financial statement about the need to generate profit from operations and/or raise money through equity capital, or borrowing to meet its future obligations. “These factors indicate the existence of a material uncertainty that may cast significant doubt about the company’s ability to continue as a going concern,” the note said. Electra Mechanic said it seeks to finance operations this year through private equity placements.